Nagato, named for Nagato Province, was a super-dreadnought battleship built for the Imperial Japanese Navy (IJN) during the 1910's. The lead ship of her class, she carried supplies for the survivors of the Great Kanto earthquake in 1923. The ship was modernized in 1934-36 with improvements to her armor and machnery and a rebuilt superstructure in the pagoda mast style. The Nagato briefly participated in the Second Sino-Japanese War in 1937 and was the flagship of Admiral Isoroku Yamamoto during the attack on Pearl Harbor. She covered the withdrawal of the attacking ships and did not participate in the attack itself. Kagero is based in Lublin, Poland. This book is in English. It is soft cover of 82 pages in 8 1/4" x 11 3/4" page format. It comes in a re-sealable cello envelope. For viewing the 3D illustrations a pair of cardboard goggles with one red lens and one blue lens is inserted in the book. Counting the front and back cover of the book there are 153 walk-around type color 3D illustrations that show every last inch of this ship's anatomy. There is a sheet inserted in the book that is 19" x 36" format, folded twice to fit the book. It has line drawings on both sides of it in 1/350th scale. The face side has side views of the port and starboard sides and the top of the ship. The reverse side has illustrations of: the pagoda like tower (2 drawings in 1/35th), 5 searchlight in 1/50th, type 90 25mm twin cannons (5 drawings in 1/50th), twin 41cm gun turrets (9 drawings in 1/200th scale) the rangefinder in 1/200th, type 96 25mm AA guns (5 drawings in 1/50th), type 96 35mm triple cannons (5 drawings in 1/50th) and a 17m Pinnace lifeboat. 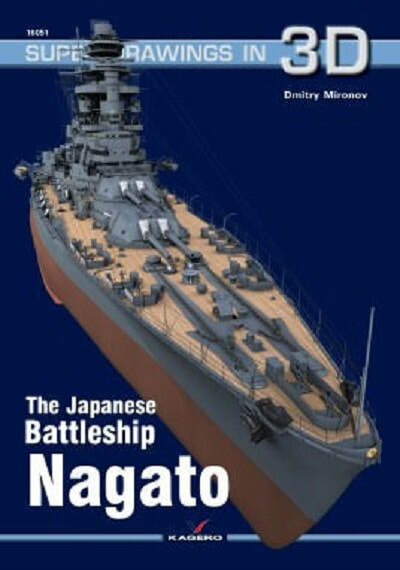 There is a Hasegwa brand kit of the Nagato in 1/350th scale, kit no. 40224 and a brass PE set also by Hasegawa for it, kit no. 72116.